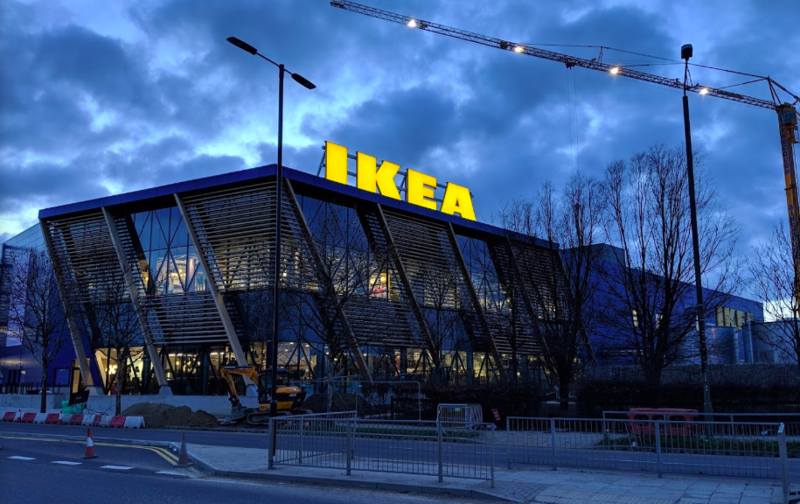 Opening today Thursday 7 February 2019 at 10am IKEA Greenwich is a big deal for south east London and promises to be the most sustainable store ever and it has a ROOF GARDEN with 360° views. Yes it’s that infamous £35 truck charge again for delivery in approximately 24 hours but until 6 April 2019 you can get £20 off so it would be £15 for a home delivery. IKEA’s mini cab service includes four cab sizes available, depending on your load and paying by card. Although we wonder how overrun the car park will be with Uber drivers trying to undercut these prices. Courier bicycle delivery is available for goods up to 25kg within a 3-mile radius. Find out more near the store exit. The store is eco friendly as it can be including greywater recycling, rainwater treatment and solar panels – plus a sensory wildlife garden, learning lab and more. There’s a community space and roof garden, which people can use for free (not sure what criteria IKEA will use to choose people). Honestly, the store in the former Sainsbury’s site is still a bit betwixt and between but there are regular buses from directly outside. Millennium Leisure Park East (Stop MH or MF) 108, 129, 132, 161, 472 and 486 buses stop outside or you can walk 5 mins from Stop M.
The North Greenwich Jubilee line tube is 5-10 minute bus or cab ride. The nearest train stations are Westcombe Park, an 11-minute walk away, and Charlton which is a 10-minute bus journey from the new store. Buses to Greenwich town centre (DLR/mainline trains) take 11 minutes. There’s 84 bikespaces but do seriously think about your safety in getting that BILLY bookcase (they are impossibly heavy!!) home. It’s not worth injuring yourself. We speak from experience. Thank you IKEA Croydon. There are 1,017 parking spaces directly opposite the store but these will quickly get snapped up so think about timing your arrival. Also take backroads if possible as the A2 is already a congested route at the best of times. Have you visited the new store? What do you think? Leave a comment below with your experiences.